First, the bad news. On this 10-year anniversary of the last major Seattle earthquake, a plan to overhaul hundreds of unreinforced masonry buildings in the city sits in limbo. Below, we’ve mapped the inventory of these buildings around Capitol Hill that the program produced. Now the good news: The natural course of neighborhood development has driven improvements at the Capitol Hill buildings with the lowest federal seismic ratings. Still, there’s plenty of unreinforced brick on Capitol Hill. After the quake, Seattle formed committees to investigate whether owners of brick should be required to bring them up to current seismic standards, as many California cities have done. Tax incentives were considered along with the possible use of police powers. 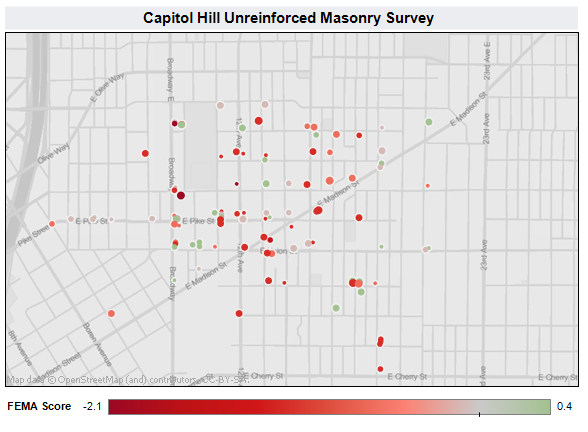 While it never shaped a solution for the seismic risks, the city’s effort did produce an inventory of brick buildings in the city — including an extensive roster of Capitol Hill’s unreinforced masonry structures. Below, we have mapped that roster. Larger dots represent buildings with multiple stories. The color scale relates to a “FEMA Score” assigned to each property — the lower the score, the higher the measured seismic risk based on a set of factors determined to influence structural integrity in the course of an earthquake. For as many buildings as the inventory identified as candidates for eventual seismic upgrades, one important takeaway is that the buildings recorded as having the lowest FEMA scores on Capitol Hill have mostly seen their risk significantly lowered by upgrades that were part of recent overhauls and redevelopments. The lowest Capitol Hill FEMA score in the 2007 survey belonged to the old CHAC building on 12th Ave. But a 2010 overhaul to make the space the new home for Velocity Dance and others included much needed seismic upgrades. Similarly, the 907-919 Pine parcels include the Odd Fellows building which also underwent a major upgrade subsequent to the survey. Meanwhile, another low scorer, the 1824-1828 Broadway properties, was torn down completely. That space is now under construction as the Capitol Hill light rail station. One of the low scorers without an upgrade is another familiar icon of the Hill. It seems unlikely a development will replace the Volunteer Park Water Tower — listed on our map as 1400 East Galer — anytime soon. It’s stood on the Hill since 1906 and survived plenty of earthquakes. The question, of course, is can it survive the next one. We’re still going through the results and will look for elements to follow up — especially properties that do not appear to have been upgraded that were listed with low FEMA scores in the 2007 survey. If you see anything worthy of follow-up, let us know. for private residences, here’s my recent experience. i made an offer on a house in the CD which turned out to have a failing brick foundation, so i walked away from it. a few weeks later the seller ‘solved’ the problem by covering up almost every trace of the failing foundation with a skim coat of concrete, so future buyers won’t be able to see the extent of decay. nice!! too bad for the sucker who buys it now. Realtors deserve plenty of blame too – – the northwest realty listings are essentially a conspirator in this sort of baloney through their steadfast refusal to allow any websites with housing listings to post user comments on the for sale listings. How is the truth to get out when they have a lock on the data? We certainly can’t rely on realtors themselves for the truth. Was someone recently murdered in the house (as is the case for a house now for sale near 520 and roanoke)? Whether it matters to you or not, realtors are under no legal claim to disclose this sort of thing.